On a street that evokes a history of the Warring States Period, you will find a local sake called "Miki" being brewed in a 4 stage value added. "Yu No Yama Kaido" is quite a quaint old road that runs by the sake brewery isn't it. 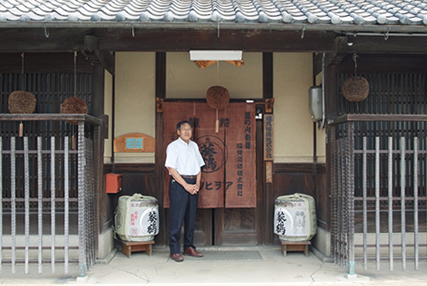 crafted local sake in his brewery remaining on the Yunoyama main road. This road was built for wounded soldiers to use to get to Arima onsen, a refuge where soldiers could receive treatment for their wounds during the long drawn out battle between Hashiba Hideyoshi and Bessho Nagaharu, Lord of Miki castle during the Warring States period. After the war during the Edo period, the onsen became popular among daimyo (Japanese nobles), and other customers coming from western parts of Japan to serve their tenure in Edo as part of the *sankin koutai. * Sankin koutai was a compulsory system put into place during the Edo period where nobles form around the country had to take turns at taking up residence in the capital, under the watchful eyes of the Emperor. 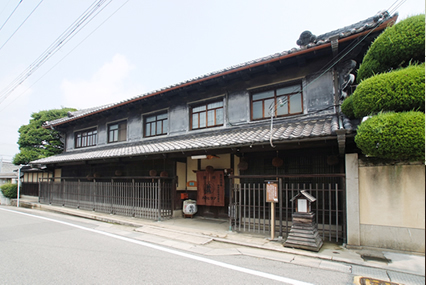 The old parts of the road exist even today, an it has become very popular with tourists along with "The city of Hardware, Miki". Our firm was established in 1898. 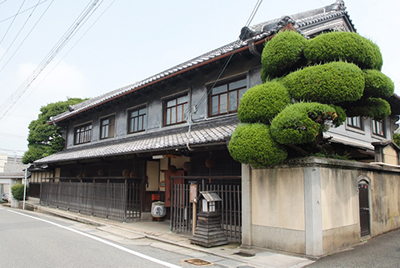 In those days there where many sake brewery's in the area, but now our firm is the only one that remains. Miki is a big producer of Yamada Nishiki isn't it. shops preserved and is filled with tourists. Now days, Yamada Nishiki is popular nationwide. And because it is popular, the rice for the sake can't just be cultivated anywhere. They say that if you are going to buy rice for brewing sake, you need to go and look at the land. However in Miki we are blessed with soil abundant in minerals. Furthermore, the basin behind Mount Rokko remains cool during summer and warm in the winter, and the small river and rolling hills make the area ideal for cultivating the tall rice used for making Yamada Nishiki. Good rice needs to have large grains and it also needs to have a large white center*. Both of these are qualities that Yamada Nishiki posses. Our firm has continued to utilize the surrounding environment quality ingredients to make our sake. * The surrounding parts of the rice grain are removed and the remaining white center is used to make sake. This influences the taste of Japanese sake. Please teach me about the special properties of your trademark brand "Aoitsuru". the character for mallow plants. OK, so the name is made up of two characters. The first character 葵 (aoi), is used on the coat of arms for the Matsuo Grand Shine. The second character 鶴 (tsuru), is the character for crane, which is considered to be an auspicious bird and a good omen. 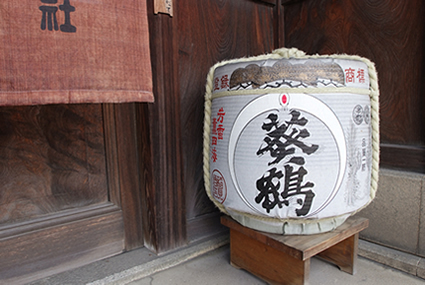 It is also a sake that has been enjoyed by the people of the Miki area for a long time. The rice is fermented at a low temperature and melted. This is what helps to give it its delicious flavor. You are vigorously engaged in slow-fermentation sake. The sake on the left edge is, "Aoitsuru Daigin Well-Cured Sake. " The unique amber color is beautiful. Our firm participates in The Conference for Research on Slow Fermentation Sake, where we display our "Aoi Tsuru Daigin koshu" product. 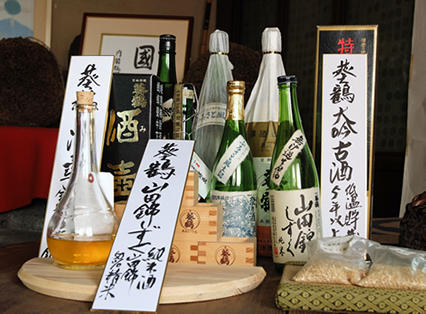 Furuzake has acidity similar to that of wine while retaining the atmosphere of traditional Japanese sake. It should of course be enjoyed accompanied with food. I would recommend enjoying it with steak, or other flavorsome cuisine. Furuzake has a rich history, however it has only recently started to cause a stir. The amount of sake that we can produce over five years is limited, however many people come to buy our product, so I think that we will have a bright future in selling sake. The lavish use Miki Yamada Nishiki production, net sake rice 50%. Taste full of the clarity was charged in whole climate of Harima. Taste of rice crowded melted in a Tanrei taste without hesitation. Junmai of the highest grade of milled rice 50%. Junmai Ginjo large honed more than half of the production Miki Yamada Nishiki. Taste with the width obtained by dissolving the U.S. to become the low-temperature fermentation, gorgeous sake incense.